WASHINGTON (CNN) -- A former State Department employee and his wife, who are accused of spying for Cuba for nearly 30 years, will remain in jail as they await trial, a judge ruled Wednesday. 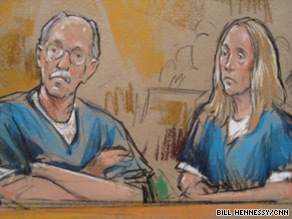 An artist's sketch shows Walter Kendall Myers, 72, and his wife, Gwendolyn Myers, 71, in court Wednesday. Walter Kendall Myers, 72, and his wife, Gwendolyn Myers, 71, are charged with conspiracy to act as illegal agents of the Cuban government, wire fraud and providing classified information to Havana, according to court documents. U.S. Magistrate John Facciola ordered the couple Wednesday held without bail after a prosecutor said they posed a flight risk. Investigators found a calendar showing that the couple planned to sail to the Caribbean in November, federal prosecutor Michael Harvey told the court. The two have the financial means to obtain false documents and flee to Cuba with their sailboat or through Mexico or Canada, he said. "They are unworthy of this court's trust," Harvey added. The couple was quiet and expressionless during the proceedings Wednesday. Kendall Myers sat with his arms folded across his chest, while his wife sat with her arms at her side. They stared straight ahead, and did not appear to acknowledge anyone in the courtroom. A defense attorney urged the court to allow them to remain in their home, where they could visit with their children. "You could disable the sailboat, freeze their funds and require ankle bracelets," Thomas Green said. The judge allowed the couple to meet briefly with their son after the court proceedings, but turned down the request to allow them to go home. He said he was concerned that the two would go to the Cuban Interests Section or the embassy of a country that has diplomatic relations with Cuba. Such a move would put them beyond the reach of federal law enforcement agencies. The State Department has not described what information the Myerses may have passed to their Cuban handlers, but said more information would come out after a full assessment. A senior State Department official said Kendall Myers was an "upper-level civil service employee" at the Bureau of Intelligence and Research who "had come up in the ranks." U.S. officials did not discuss the Myerses' motives for their alleged work for the Cuban government. Conviction on the wire fraud charge would carry a sentence of up to 20 years; illegally acting as an agent of a foreign government would carry a sentence of up to 10 years; and the conspiracy charge would carry a sentence of up to five years. Myers retired from the State Department on October 31, 2007. He had viewed more than 200 classified reports on Cuba in his final months, even though he was an analyst on European issues at the time, court documents say. The couple has been held without bail since pleading not guilty Friday. A future trial date has not been scheduled.